A transcript of the audio you can listen to above follows. 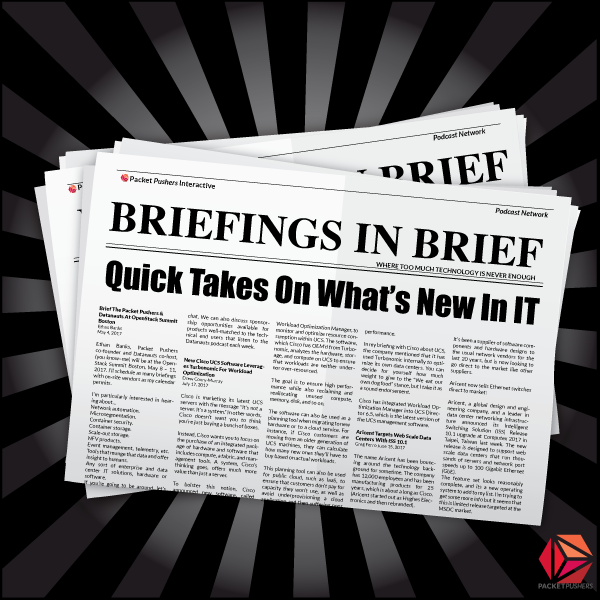 Welcome to Briefings In Brief, an audio digest of IT news and information from the Packet Pushers, including vendor briefings, industry research, and commentary. I’m Ethan Banks, it’s June 13, 2018, and here’s what’s happening. I had a briefing with Rubrik’s technical marketing team on June 5th. Rubrik is an explosively growing data protection company. Gartner positions them in the Data Center Backup & Recovery Solutions category. If you have been reviewing your multi-cloud, hybrid cloud, and on premises backup schemes and haven’t evaluated Rubrik, you should. They are winning a lot of deals. In this briefing, Rubrik discussed many aspects of their Alta 4.2 software release. The feature expansion, improved service offering, and overall enhancement list is quite long. One highlight is that of Rubrik’s ecosystem expansion, where Alta 4.2 offers AWS native protection for EC2, VMware vCloud Director integration, Windows full volume protection, as well as AIX & Solaris support. All of that feeds into Rubrik’s core value proposition of protecting your data no matter where it is. What Rubrik’s done here is take their history of using native APIs to backup hypervisor-based platforms from VMware and Microsoft, as well as apps like SQL Server, and apply that native API philosophy to AWS EC2. Rubrik is using AWS’s native abilities to take snapshots of block volumes. This works whether the Rubrik instance is on premises, or in your cloud. The big deal here is that this helps automate lifecycle management for EC2 snapshots, formerly something that had to be done manually. Backing up? AWS makes that easy enough. But tracking each snapshot…up to you, which is what Rubrik is helping with here. With Rubrik managing the EC2 snapshots, you have the benefit of a management system that can rapidly assist with recovery. Rubrik knows about your EC2 snapshots and what’s in them, meaning you can use Rubrik to quickly do a restore. In fact, Rubrik demoed a simple restore from a snapshot of just a couple of clicks through the GUI dashboard familiar to Rubrik customers, compared to at least 5 discreet CLI steps required within AWS if a customer were to perform this task by hand. A related simplification is that of file-level recovery. Rubrik demoed being able to search their index of EC2 snapshots for a specific file and restore it. This is a major enhancement over the AWS method of file restoration, where an EC2 snapshot would have to be individually mounted and searched manually for the lost file. Another benefit of using Rubrik to manage these snapshots is the ability to put EC2 instances where you need them. Want to replicate an instance in a different availability zone or region? You can do that without a lot of drama via the Rubrik interface. You might have thought of this already, but yet another benefit is that you’re gaining the ability to manage all of your data across your IT environment in one place. If Rubrik can manage the data in question, you don’t have to go to multiple toolsets to handle backups, restores, queries, and so on. Rubrik is doing their very best to make sure that no matter where your data is, they can protect it and unify the management of it. Just because some data is in the cloud and some other data is on premises, the process shouldn’t have to be different, according to the Rubrik philosophy. For more information about Rubrik, AWS Native Protection for EC2 Instances, and the rest of the long list of new features available in Alta 4.2, visit rubrik.com. Right on the front page, they’ve got a splash about the Alta 4.2 announcement. I barely scratched the surface of everything Rubrik packed into the release.